I seem to be doing an impromptu schottische mini-series this week; here's another interesting little variation from M. B. Gilbert's Round Dancing (Portland, Maine, 1890) and G. W. Lopp's La Danse (Paris, 1903). The Columbia, like the American Gavotte, was adopted by the American Society of Professors of Dancing at their New York meeting in the September of 1886, as mentioned in my post on that dance. Unlike the American Gavotte, it is perfectly clear that it belongs in the schottische category, and like the Schottische Gavotte, it shows distinct influence by the racket. It is attributed to dancing master E. C. Spink. Gilbert and Lopp's descriptions match each other nicely. The dancers start in normal ballroom hold, the gentleman facing the wall and the lady facing the center, with the gentleman starting on the left foot and the lady on the right. Their steps move in parallel. Repeat the third and fourth bars indefinitely. I suppose this could be considered the next post in a very stretched-out series covering American "gavotte" variations for the late nineteenth century schottische; my first post on the topic appeared almost ten years ago. I'm glad I put this one off a bit, however, since my experience since then with reconstructing, dancing, and teaching rackets has given me a better appreciation for how this "gavotte" variation works. Essentially, it's two halves: a slow schottische turn and a racket. It's kind of beautiful. The Schottische Gavotte, like so many other variations, is found in M. B. Gilbert's book of couple dances, Round Dancing (Portland, Maine, 1890) and in G. W. Lopp's La Danse (Paris, 1903). Gilbert does not attribute it. Lopp attributes it to Gilbert. Lopp also lists it as 3/4, but since it is under schottische, notated like a schottische (in 4), and has a given metronome speed of 76 beats per minute in schottische time, I think that 3/4 is an error and it is intended to be in 4/4. Other than that, the two descriptions agree nicely and the reconstruction is quite simple and straightforward. The gentleman starts with the left foot, the lady with the right. Third in my impromptu mini-series of late-nineteenth century French dances based on the schottische or pas-de-quatre is La Lyonnaise, which appears to me to be unimportant in and of itself but somewhat interesting as an example of typical variations and a source for variations to use in improvisation. Despite having been published in 1890, it does not appear in the seventh edition of Eugène Giraudet's Traité de la danse, published in the early 1890s. It does turn up by the 58th edition (c1900), which informs us (via the extensive dance glossary in volume II) that Giraudet choreographed it himself. I don't think it does him any particular credit; it's just a mishmash of steps. La Franco-Russe is another of the short French schottische-based sequences of the late nineteenth-century France. Like La Stéphanoise, it is a double-length sequence, eight bars of schottische music, and presumably had its own special tune which has, alas not surfaced during my searches. Unlike La Stéphanoise, it is more of the Pas-de-Quatre style of schottische (with the dancers holding only inside hands to start and coming together in the second half) and has a clearly-explained reason for its name. It also differs in having a true "double" (AABB) schottische pattern and no ambiguity in its timing. And, finally, it may have had a bit more success than La Stéphanoise, or at least been more favored by Giraudet himself. Giraudet stated that La Franco-Russe was "créée en l'honneur des officiers russes à leur visite à Paris en 1893." This visit was part of a series of negotiations between France and Russia that led to the Dual Alliance, also known in the west as the Franco-Russian Alliance and in Russia as the Russian-French Alliance. At left, a French political cartoon from 1893 (click to enlarge) shows the French symbol, Marianne, cuddling with the Russian bear. There was quite a vogue for things Russian, or imagined to be Russian, in Paris during the early 1890s, and La Franco-Russe is one of several dances with a Russian or Alliance theme. La Stéphanoise is a schottische-style sequence created and published in the late nineteenth century by French dancing master and writer Eugène Giraudet. The first reference I have to it is in the seventh edition of Giraudet's Traité de la danse, published in the early 1890s. Since I do not have any earlier editions, I don't know precisely when it was first included in Traité. More specifics come from the lengthy dance list in the second volume of the gigantic 58th edition (c1900), where it is attributed to Giraudet himself, with "Hamel" given as the composer of the music and a date of 1892. The description of the sequence is word-for-word identical in both editions. Cette danse, bien que de création récente, a obtenu dès ses débuts un véritable succès, surtout chez les connaisseurs; aussi les professeurs et artistes, l'ont-il adoptée avec un empressement significatif. L'effet produit par cette nouvelle danse est des plus gracieux, et il n'est pas de bonne société, qui ne la possède dans son répertoire. Le succès, qui l'a accueillie à ses débuts, ne fera que s'accroître, ce qui sera peut-être difficile étant donné l'engoûment actuel. This dance, although of recent creation, has obtained, since its début, genuine success, above all among connoisseurs -- also teachers and artists -- who have adopted it with significant alacrity. The effect produced by this new dance is of the most gracious, and he who does not have it in his repertoire is not of good society. The success which has welcomed it since its début can only increase, which may be difficult given its current popularity. 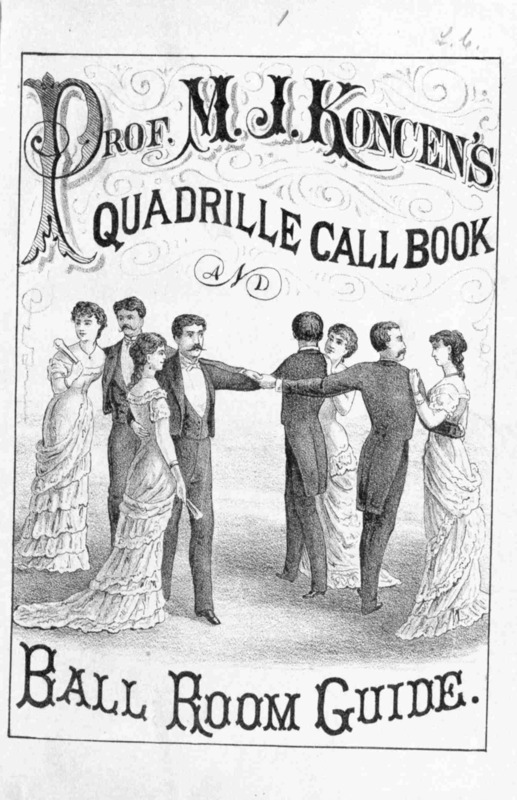 Like the Quadrille du Pas de Quatre, le Moulinet du Pas de Quatre is an experiment by French dancing master and author Eugène Giraudet in adapting the standard Pas de Quatre (a version of the schottische popular in Europe in the late nineteenth century) for small sets of dancers. The Moulinet is a simple sequence dance, alternating between a short figure for two couples (done to schottische music) and waltzing. It involves only half of the standard Pas de Quatre step-sequence, which makes it a gentle and accessible introduction to the schottische for those new to the dance. Créée le 10 mars 1897, pendant une récréation de leçon, avec le concours de MM. et Mlles Mourets, ses élèves, qui ont aidé le maître, par leur gracieux dévouement et leur lumière élégante, ce qui a fait de cette danse la plus belle création du siècle et du maître. Created on 10 March, 1897, during a break in a lesson, with the cooperation of the Monsieurs and Mademoiselles Mourets, his pupils, who have helped the master by their graceful devotion and their elegant light, which have made of this dance the most beautiful creation of the century and of the master. Giraudet also offered his "sincères hommages" to these pupils, from which I would construe that he had as much interest in the family’s continued patronage as in the quality of the dance. "The most beautiful creation of the century and of the master" is a vast, vast exaggeration. Was it actually danced after that one lesson? It’s hard to say how popular any dance like the Moulinet became outside its creator’s own studio, but Giraudet certainly made an effort to promote it over the years. In the July of 1903, the Société internationale des maîtres choréographes held a congress in Westphalie. Giraudet, as president of the Société, was heavily involved, and when the dancing masters had finished making speeches bashing the “grotesque et ridicule” cakewalk and generally lamenting the state of the modern ballroom, they settled on seven more respectable dances to accept for the 1903 season. Fourth of these was the Moulinet. This backward-looking decree was reported with varying degrees of sarcasm in Parisian journals such as Le Temps and Figaro. Le Moulinet du Pas de Quatre aura pour prélude le Pas de Trois; celle-ci, sera dit-on, réservée aux mathématiciens. The Moulinet du Pas de Quatre [four] will have for its prelude the Pas de Trois [three]; this one, it will be said, reserved for mathematicians. And in early 1907, the Moulinet appeared in a list of dances “en vogue” in les salons (as opposed to among “la société c’est-à-dire (la bourgeoisie) et le peuple”). On to the practical details. The Harvard Caprice was created by dancing master Melvin Ballou (M. B.) Gilbert of Portland, Maine, matching the music of the same name by Albert L. Ryser. I don't know whether the dance was created for the music or the music commissioned to match the dance, but the earliest publication of the sheet music that I have (cover shown at left; click to enlarge) is part of a series specifically for Gilbert's dances. This was not the only Harvard-themed dance created by Gilbert; two years later, he went on to create the Harvard Dip. NEW YORK, Oct. 30. — Every year a number of agile and graceful gentlemen composing the American Association of Professors of Dancing come together, and, after deep thought and considerable wrangling, of course, in a most polite way, decide what the fashionable dances will be for the coming year. Each of these gentlemen is an inventor of the terpsichorean order, and he attends the conclave with elaborately drawn diagrams of the dance with which he expects to convulse society later on. In nine cases out of ten this dance is never heard of again, although it may receive the richest possible indorsement [sic] of the American Association of the Professors of Dancing. The fault is not with the Association. The members certainly recognize a graceful dance wen they see it; the trouble lies with the public. The association has just had its annual meeting for 1896 and some terpsichorean wonders are ready to be thrust upon the dancing public. The official titles of these wonders are: The Harvard Caprice, the X-ray Lanciers, the Hanover Quadrille, the Esprit d’Amerique, the Waltz Two-Step, and La Czarina. It will be a matter of interest for those who pay attention to such things to memorize these titles and then observe how popular they become during the approaching winter season. The Military Schottische Series is a "class dance", a practice or exercise series to work on the movements of a particular dance. It is a particular characteristic of the Military Schottische (briefly described here) and its descendants that the first part is done side by side, both dancers facing forward, and the second turning, the dancers in closed position. The Series doesn't follow that pattern precisely (there is no closed position turn at all), but it keeps the general concept of the first half traveling along line of dance and the second doing some sort of turn. The Series is described in gender-neutral terms: the "dancer on the left" and the "dancer on the right". In a dance school setting it would be quite normal to have two girls or two boys dance together. It would also be possible to use this as a performance or recital piece. The Director, June 1898. This was a short-lived dance periodical edited by M. B. Gilbert. School Dances, 1913. This is a posthumous publication attributed to M. B. Gilbert but edited by Susan Hoffman Gilman. Gilbert was a major figure in American dance of the late nineteenth century and is best known today from his collection of couple dances, Round Dancing (Portland, Maine, 1890). I talked a bit more about his various pursuits here. The Military Schottische Series is uncredited, but I think it very possible that he wrote it himself. Winding up my little schottische mini-series, I have a simple little variation found, as far as I can tell, only in George Washington Lopp's La Danse (Paris, 1903). Le Four Step Schottische is composed solely of -- you guessed it -- sequences of four steps (walking or slide-close-slide-closing) and turning two-steps. This is schottische deconstructed to the point of having almost completely lost any distinctive characteristics of the dance, foreshadowing the simple schottisches of the ragtime era. The variation itself is negligible, but fitting it in among related schottisches of the late nineteenth and early twentieth century is interesting. The dancers begin in a regular ballroom hold, both turned slightly outwards to face along line of dance. The gentleman begins with the left foot and the lady with the right. Most of Lopp's schottische are given a metronome count of 72, but Le Four Step gets a brisk 84, presumably because its steps are so simple that it is easy to dance quickly. In the general theory of turning couple dances, one could reverse the direction of the turning two-steps. This schottische looks like quite the outlier, but it's actually a fairly logical development within schottische's evolution in the last two decades of the nineteenth century and first two decades of the twentieth. The five-step schottische was not E. Woodworth Masters' only choreographic effort. Interestingly, considering its American origin, I first ran across A L'Avenir in the pages of Dancing, a London periodical similar to The Director, Galop, The Two-Step, and other efforts by dancing masters to establish dance journals. In the December, 1892, issue, the editor notes that the November issue of their "transatlantic contemporary" included the editor's version of the "Waltz Menuet" and that (therefore?) they include in this issue instructions for a new American dance, "L'Avenir", by "Mr. W. Masters, of Boston, United States". The editor in question was probably R. M. Crompton, creator of one of several late nineteenth-century "waltz minuets". The music seems also to have been composed by Masters; no one else is credited. A L'Avenir (the full name) was adopted by the American National Association of Teachers of Dancing at their convention in Washington, D.C., held from June 10-13, 1890. The sheet music is copyright 1891. A L'Avenir is described as "A New Round Dance, Combination of Dance Movements". It certainly is that. The name means "for the future" or "henceforth", which raises the terrifying possibility that this is what Masters thought dancing would or should look like in the future. The hodgepodge of movements he created is interesting, at least: a twenty-four-bar sequence in schottische (4/4) time. Twenty-four bars is an unusual length for a sequence dance, but a quick check of the music reveals that it consists of twelve eight-bar strains, with the first, fourth, seventh, and tenth all being the same. So the dance done four times through would match the sheet music nicely. The Imperial Gavotte is one of the many schottische variations included in M. B. Gilbert's book of couple dances, Round Dancing (Portland, Maine, 1890) and in G. W. Lopp's La Danse (Paris, 1903). It is attributed to Professor A. T. Graves of Albany, New York, and noted by Gilbert to have been accepted by the American Society of Professors of Dancing in New York on September 4, 1889. The Society endorsement gave it enough exposure for it to turn up outside Graves' own studio: in the October 26, 1890, issue of the St. Louis Post-Dispatch (St. Louis, Missouri), it is listed as one of the new dances to be taught by John Mahler. The music for the Yale Schottische was composed by J. Edward Geary, but the dance was choreographed by a local dancing master, C. Francis Malone, who regularly taught Yale students, probably including some of the football players in the photograph! An article about Malone from 1896 notes that the Yale Schottische has been "danced onstage at Daly's Theater, New York, and in the greater part of the United States." The Yale Schottische is actually a double-length schottische sequence -- eight measures instead of four. The general pattern of the dance is quite straightforward, but several details are left unspecified. I have used my best guesses on those and included both options where there is no way to make a definitive choice. The classic schottische of the mid-nineteenth century and its later incarnation, the Barn Dance (a.k.a. the Military Schottische and the Pas de Quatre) had mostly faded from fashionable ballrooms by the late 1910s. But a few very simple schottisches or schottische-like sequences turn up now and then in dance manuals and on sheet music of the 1910s, often under the name "gavotte", a musical form with the same 4/4 meter characteristic of the schottische. La Gavotte is a short sequence taken from Professor A. Lacasse's La Danse apprise chez soi, published in Montréal in 1918. There were many dances called "gavotte" in the late nineteenth and early twentieth centuries, not all of them in 4/4 time, so while this particular gavotte may have been locally popular in Montréal, it should not be considered any sort of definitive gavotte for the 1910s or any other era. Lacasse described La Gavotte as one of several "Danses de Fantaisie", a group which also included the Ostende, the Spanish Boston, Bellfield, and the Oxford Minuet. It's hard to know exactly how to translate "danses de fantaisie", which literally means "imaginative dances", but all of those given are sequences, though some are very short ones. He noted that these dances were still on programs and were danced mainly "in our private families", which implies that they were traditional favorites rather than the very latest fashion. La Gavotte apparently was notable enough to be listed on the title page, along with the one-step and foxtrot, as one of the principal dances in the book, though that may well be a sign more of how trendy the name "gavotte" was than of the popularity of this particular sequence. A comment from one of my Russian correspondents that the schottische was rarely, if ever, danced in Russia in the nineteenth century* started me thinking, after a series of mental jumps**, about how well-accepted (or not) the schottische was in America in its early years. There appears to have been some dissension on the merits of the dance after its introduction to America around 1849. Edmund Ferrero claimed in The art of dancing (New York, 1859) that the schottische had "acquired great favor", and all the major dance manuals from the end of the 1850s onward include it. But the anonymous author of Beadle's dime ball-room companion and guide to dancing (New York, 1868) claimed that the schottische was considered "vulgar". Since it appeared regularly on dance cards from at least the late 1850s all the way into the early twentieth century, that can't have been a universal opinion. But was it really anyone's other than, presumably, those of ministers and others who condemned dancing altogether? Two short stories from the famous nineteenth-century women's magazine Godey's Lady's Book suggest that the popularity and vulgarity were not mutually exclusive, and that there was continuing concern in some circles about "fashionable" dancing. Having decided that the Bon Ton Gavotte was popular enough to perhaps be worth doing, how does one actually do it? Let me start by noting that as reconstruction projects go, the Bon Ton Gavotte is a mess: two sources are ambiguous and the other two contradict each other. Since they cannot all be reconciled, I cannot produce any really definitive reconstruction. Instead, I'll go through the sources one by one and give my thoughts about the various options. I mentioned the Bon Ton Gavotte briefly and unflatteringly a couple of months ago in the context of its possible appearance on an 1894 dance card. I haven't changed my opinion of the dance, but in the course of unrelated research I've accidentally accumulated more information on it than I ever would have expected. I am apparently fated to try to make sense of it. One of the common questions I get whenever I teach one of these weird little late nineteenth-century dances is whether it was actually done anywhere outside the creator's dance studio, which in this case was in Pittsburgh, Pennsylvania. Much to my astonishment, the answer in this case seems to be yes. Even leaving aside the dance card's ambiguous "Bon Ton", the trail of the Bon Ton Gavotte runs from not only through the northeastern United States but also as far as California, Ontario, Nova Scotia, England, and France. Skibo, "The New Ball Room Dance", is a short sequence dance by Professor R. O. Blackburn set to music by Joseph T. Kane. It was published in Ohio in 1910. The cover of the sheet music may be seen at left; click to enlarge. The music is not labeled a schottische but does have a schottische-like feel and strathspey-like patterns with a sort of Scottish "snap". The date of the dance and the Scottish flavor of the music suggest that it was named after Skibo Castle, originally built in the 12th century but extensively renovated by the industrialist Andrew Carnegie in the early 20th century, who added a golf course. Carnegie's renovations were covered in the American press (including articles in The New York Times). A Carnegie family photo album with pictures of Skibo Castle from 1908-1910 may be found in Georgia's Virtual Vault. The castle and the surrounding estate, no longer Carnegie-owned, are currently a private country club probably best known for hosting Madonna's wedding to Guy Ritchie in 2000. I have no evidence that the dance was actually associated with the castle or the Carnegies. I think it more likely that it was simply an attempt to cash in by association with the famous property of a wealthy family. I've also never run across any mention of Skibo outside of this sheet music and suspect that calling it "The New Ball Room Dance" was merely ambitious advertising. The Bolero, or Dodworth Schottisch, is a real oddity in mid-nineteenth century American dance. For starters, it is neither a Bolero in the sense of the Spanish dance nor, technically, a schottische in either music or dance pattern. It's a weird little schottische-mazurka mashup created by Allen Dodworth himself, and I can't imagine it was ever danced outside his own dance studio. Actually, I'm not sure it was ever danced, period, since some aspects of the dance seem rather poorly thought out. But I find it oddly intriguing and no stranger than the five-step waltz, which did catch on to some extent. It's an interesting example of early creativity in developing new couple dances before the mid-nineteenth century repertoire achieved some degree of standardization. The sheet music for the Bolero, "Dodworth's New Schottisch", was published in New York in 1850. Covers varied; along with the one pictured at left (click to enlarge), courtesy of the 19th-Century American Sheet Music collection at the University of North Carolina at Chapel Hill, there is one without the fancy scrollwork border in the Library of Congress's Music for the Nation collection, and I have a copy of one other with a different border printed in red. The printing is exactly the same in each other than the cover decoration or lack of it. One of the myriad minor schottische variations described in M.B. Gilbert's Round Dancing (1890), is notable as the earliest appearance I've noticed of what has become the standard style for the first part of modern folk schottische: three running steps forward in "military position" (as described in my previous post, "À la Militaire") rather than the step-close-step of the nineteenth century dance. Gilbert attributes the Star Schottische to W.F. Mittman. The steps below are described for the gentleman; the lady dances on the opposite foot. Gilbert does not describe what the free foot does during the hops in the first part; it could be extended into a raised fourth position forward or simply tucked next to the hopping foot. The movements of this dance were arranged by me for special use in children's classes, and I found the combination a pleasant innovation. I also found it pleasant; it's actually slightly less "busy" than a regular galop. And its ambiguity on where the turn (if any) happens is interestingly similar to that of the racket. By the last quarter of the nineteenth century, as the standard Victorian couple dances were becoming somewhat stale, there was a flurry of innovation among dancing masters attempting to come up with new variations, most of which do not appear to have caught on widely. In M.B. Gilbert's 1890 tome, Round Dancing, he describes a variation, the Schottische à Pas Sauté, which resembles the old "doubling" of the schottische parts (as described in my review of the early schottische) in consisting only of "step-hops" but employs the recently stylish "military position", as described in my previous post, "À la Militaire", rather than using the closed position of the earlier era throughout. Gilbert footnotes this variation as the Hop Waltz, harking back to the jeté waltz of the Regency era. Both the first and second parts of the Schottische à Pas Sauté consist entirely of step-hops. The steps below are described for the gentleman; the lady dances on the opposite foot. Repeat all of the above for a second complete turn. The word "step" rather than "leap" is used throughout; perhaps leaping was considered unnecessary with so much hopping involved. The term "gavotte" has referred to a number of different dances since its earliest appearance in the 16th century. In this post, it refers not to any of these specific dances, but to a pair of schottische variations described by noted 19th-century dancing master M.B. Gilbert in his manual of couple dances, Round Dancing (Portland, Maine, 1890). As far as I can tell they have neither anything in particular to do with the earlier dances known as the Gavotte (or the mid-19th century promiscuous quadrille figure of the same name, described here), nor any distinctive choreographic feature that might supply some reason for the use of the term in their names. Nor are these variations common in other dance manuals, suggesting that they were rarely if ever danced outside the studio. Edited 12/4/14 to add: The gavotte connection seems to be in the music, rather than the choreography. The gavotte-schottische link is found in a number of other dances of the late nineteenth and early twentieth centuries. I nonetheless find them worthy of writeup not because they are particularly compelling sequences but because of what they reveal about approaches to varying the schottische at the end of the nineteenth century, approaches that might be exploited by the experienced late Victorian dance reenactor. The Five Step Schottische, as described by prominent late 19th-century dancing master M.B. Gilbert in his tome of couple dances, Round Dancing (Portland, Maine, 1890) and later by Marguerite Wilson in her oft-reprinted Dancing (Philadelphia, 1899), squeezes five movements, rather than the standard four, into each bar of schottische for an interesting variation which alternates sideways slides and half-turns for a sequence similar to that of waltz variations such as the contemporary Le Metropole (also included in Gilbert's manual) or the later Five-Step Boston described by Philadelphian Albert Newman in 1914. Putting this combination into schottische rhythm makes for an interesting but not overly complicated dance worth resurrecting by the modern late-19th-century dance reenactor. Some more appropriate name might have been given to this dance, but I think it best to adhere to the phrase, rather than take upon myself a lingual reform. Although this dance is better known as the Five Step Schottische, the name given above [Redowa Schottische] is far more appropriate. The name Five Step Schottische, however, is more straightforwardly descriptive and thus more useful. While no other dancing master that I have found includes the waltz-galop by name, the accenting of a waltz step done in duple rather than triple time is discussed by Allen Dodworth in Dancing and its relations to education and social life (1885, reprinted several times through 1900) and is included in dances such as the turn-of-the-century Pasadena, and the idea that waltz steps can be transposed from triple to duple and vice-versa dates back as far as the sauteuse waltz of the first quarter of the 19th century. English dance teacher William Lamb, in his Everybody's Guide to Ball-Room Dancing (London c1898-1900), published quite a few short dance sequences, most of limited interest to the average dancer. His American Schottische has more potential than most of these because it does not involve any reverse-line-of-dance movement and thus can be easily used as a simple variation when dancing a late 19th-century schottische. Despite the name, there is nothing specifically American about this particular sequence, and it does not seem to have been taken up by other writers/compilers of dance manuals, even those who otherwise plagiarized Lamb quite freely. I suspect it was not a particular hit, perhaps never having any life in period outside the pages of Lamb's book. Nonetheless, I find it quite danceable and an interesting break from more typical schottische patterns. The Union Dance is a short, schottische-like dance sequence which I have found in only two sources: Thomas Hillgrove's 1863 A Complete Practical Guide to the Art of Dancing (pp. 170-171) and the 1883 Professor M.J. Koncen's Quadrille Call Book and Ball Room Guide (p. 89) The latter is a compilation of numerous other sources and the instructions therein are nearly identical to the earlier ones, so Hillgrove may be regarded as the preferred source for dating this dance. Given the timing and Hillgrove's location in New York, it is possible that the name of the dance was meant as a political statement, though it is also possible that it was simply the name of a tune to which it was danced or a completely random title. By the 1910s, the schottische had almost complete vanished from the ballroom floor. But a few dancing masters were still creating variations, among them the "Pan-American Glide," published in the F. Leslie Clendenen's collection Dance Mad, or the Dances of the Day in St. Louis in 1914. It is attributed to F.W. Bouley. The name of the dance does not signify anything special about it choreographically. It appears to merely be one of many uses of the term "Pan-American" in the early 20th century, playing off of the Pan American Union (so named in 1910) and the 1901 Pan-American Exposition in Buffalo. At the end of the four walking steps, close up again to repeat from the beginning. I'm not aware of any great popularity for this variation, and it's quite possible that it was never done anywhere other than in Mr. Bouley's lessons. But it makes a particularly easy sequence for beginners and allows for a bit of schottische mixed into the usual dances of the 1910s. Here's a first for Kickery: a reconstruction of an entire quadrille! The Original Set of Schottische Quadrille [sic] was published in Boston in 1862 in a compilation manual attributed to Elias Howe. I have found no other sources for this particular quadrille. I'm going to work through the entire dance figure by figure with a bit of discussion about the choices I made in this reconstruction. Those who just want to print out the calls and take them off to teach it without having to sort through my reconstructive nattering, despair not: there's a link at the bottom of this post to a PDF handout you can download. By the 1880s, the major couple dances of the mid-19th century were losing their dominance in the ballroom. While the waltz retained its popularity, the polka, schottische, and galop had begun to drift out of fashion, soon to be superseded by the two-step in the 1890s. Dance teachers such as Melvin B. Gilbert and his fellow members of the American Society of Professors of Dancing, fearing for their livelihoods, continued to create new variations on the old dances, and variations on the variations, with, apparently, little luck in making any of them fashionable. The two major American dance manuals of the late 19th century were by Allen Dodworth (Dancing and its relations to education and social life, 1885), who primarily looks back at the older dances, and Gilbert himself (Round dancing, 1890), who published an astonishing collection of variations by himself and other dancing masters for all of the major couple dances. While most of these faded into obscurity (in many cases, deservedly so), there is one group of dances with the common tag of "Military" in their names which is notable in actually having a survivor: the Military Schottische appears occasionally in other dance manuals of the late 19th and early 20th century. A short, performance-oriented summary for those who want to skip the background and just go out and schottische. This is intended as a summary for those already generally familiar with couple dancing, not as a way for new dancers to learn from scratch; a live teacher is always to be preferred to a written description. A fuller discussion of and list of sources for the schottische may be found in The Early Schottische. One of the most popular couple dances of the mid- to late 19th century, the schottische first began appearing in dance manuals in the 1850s. The noted Parisian dance teacher Cellarius, writing in the late 1840s, did not mention it at all. In Markowski et ses salons, a gossipy look at the Parisian demi-monde published in 1860, it is claimed that Polish dancer and Parisian dancing master Markowski invented "la scottish" (among many other dances, including the Hongroise) during a period of dire poverty but great choreographic creativity in the 1850s. The picture of the great dancer creating dances in his lonely Parisian garret has charm but in the case of the schottische seems unlikely to be accurate.